THIS COLLECTION IS CURRENTLY UNAVAILABLE. Please sign up for Julianne’s mailing list if you would like to be notified when it becomes available again. 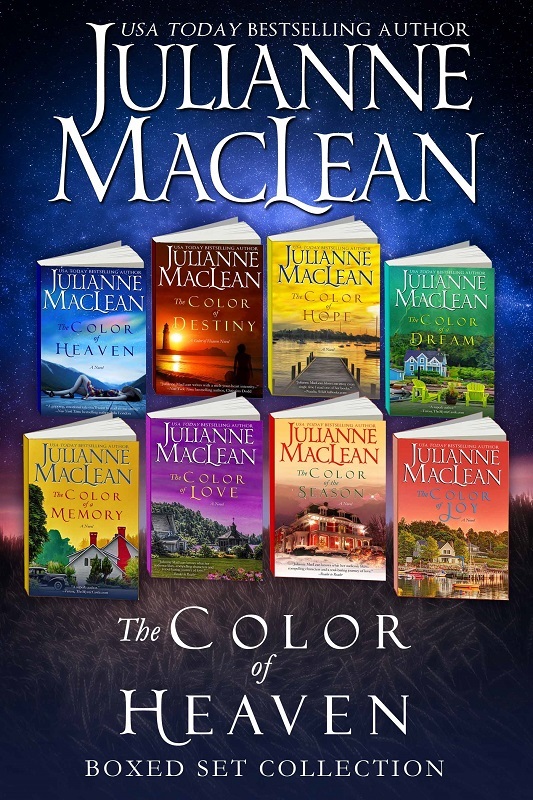 Find out why readers worldwide are captivated by the Color of Heaven Series in this 8-book collection from USA Today bestselling author Julianne MacLean. Full of surprising twists and turns, these fast-paced, emotionally gripping tales about characters who overcome seemingly insurmountable odds—and find love in the process—will leave you amazed and inspired. This boxed set is 40% off the original list price of the individual novels—an incredible savings. The collection also includes, as bonus content, the author’s suggestions for book club discussions. A deeply emotional tale about Sophie Duncan, whose near-death experience unlocks shocking secrets from her past, and teaches her what it means to truly live…and love. More than a decade after being pressured to give up her child in a teenage pregnancy, Kate Worthington crosses paths with a captivating man who makes her question the possibility of destiny. Diana Moore’s life is turned upside down when she learns of a mysterious woman who works nearby – a woman who is her identical mirror image. While recovering from a heart transplant, Nadia Carmichael is haunted by a recurring dream that sets her on an extraordinary, life-changing path to discover the identity of her donor. Still grieving from the loss of her heroic firefighter husband, ER nurse Audrey Fitzgerald meets a woman who has some secret, unexplained connection to her husband. A year after Carla Matthews’ husband goes missing in a plane crash, a man is found floating on an iceberg in the North Atlantic, uttering her name. Is it possible he will come home to her at last, or does fate have other plans in store? Riley and Lois James are devastated when their newborn vanishes from the hospital. As the police close in, strange clues about the baby’s whereabouts begin to emerge, and soon a surprising twist of events challenges everything Riley ever believed about love and the existence of miracles.